The Edge of the Nest was a success! 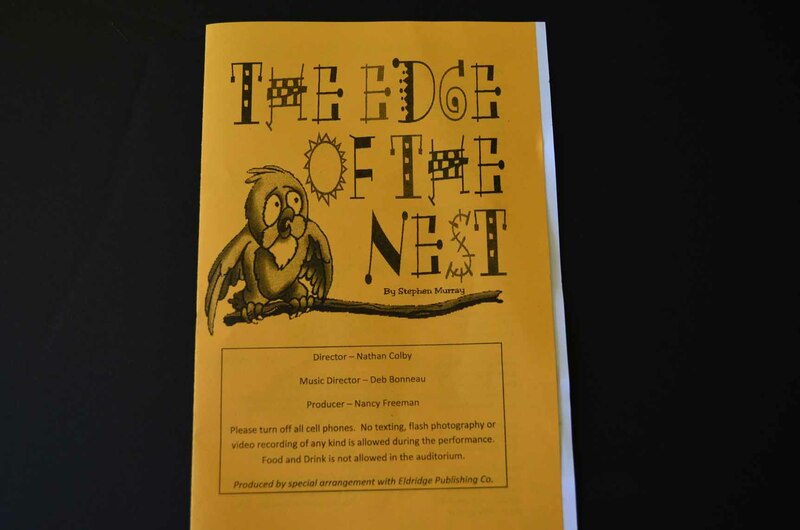 After my bookselling event at Staples HQ, I participated in my school’s theater production of The Edge of the Nest. The musical is composed of many skits, many of them comedic. While there is no main character, some of the scenes chronicle the life of Chloe, a girl that is just a little too attached to a stuffed animal. I, David Lee, play the dad in Scene 5 (Military Babysitter) and Student 1 in Scene 10 (Substitute Teacher). I felt nervous as the play started. It was the first play I had ever been in since I was in kindergarten. Like many people, I can get stage fright, and my diction may not be as good as my acting. I was running over the lines in my head, then BAM, the curtains parted, the floodlights fired dazzling beams of light, the pianist started playing, and the show began! The first couple of acts were a breeze to me. They were mainly songs, and the choreography for us was pretty lame compared to the choreography in Phantom of the Opera (my favorite musical). Then the scene before my first acting appearance began. I went backstage and put on my costume (a suit). I put a folded index card in one pocket, and oh no! Time was running out! I stuffed two random fake dollars in my other pocket (they were supposed to be twenty-dollar bills) and walked on stage. Balancing my stage fright with my skill on dramatizing, I whizzed through my lines. There was mild laughter throughout my act, but the part at the end where I say “Here’s another $20. We’ll see you next week,” everyone was howling. Maybe it was the slightly exaggerated gestures I did, or the way I said those words, but I received the largest amount of laughter I would ever get in the musical. After a couple more songs and scenes, it was my second turn to go on stage as Student 1. If you had looked at the original script, all my improvised choreography would contrast greatly with the typed choreography. I went through that act, and I received much less laughter. I felt that the humor I emphasized by pretend-sleeping during the class scene looked too artificial. The intermission began after the lunch lady scene and lasted for fifteen minutes. Act 2, which explores the teen years, started after intermission. The funniest scene in the musical, however, was the fast food scene. Then a few skits later, everyone did the final song, thanking parents for supporting their child through life.